The Waterfront: Beauty of the Hills at Risk Exhibition! Joan McGivney (President, North York Visual Artists) and our very own Tony Cook were among 30 or so artists who trekked north last July for a paint-out in Melancthon Township in protest against the proposed MegaQuarry. 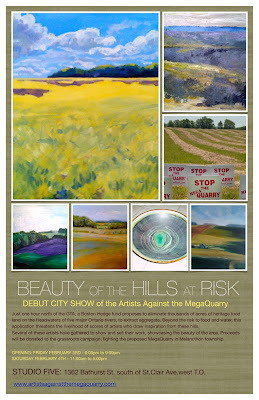 On February 3 and 4, 2012, Artists against the MegaQuarry will mount their debut Toronto City show and sale, with all proceeds going to support the fight against the quarry. Tony hopes you can come and support the cause against destroying this beautiful landscape so beloved by Ontario artists. Click on the image below to see a larger version. Thanks for making us aware of this situation and resulting exhibition. Let's everyone spread the word and visit the artists during the exhibit.